Awesome App that brings the Nepali community together with Nepali Calendar, Festival Schedules, Latest News, Live Radio, Nepal Rastra Bank Live Forex (foreign exchange) & Live Bullion Info (Gold/Silver Price). This App is also available on your Apple Watch. 3. View and share Nepali date , events and thithi via imessage. 6. Listen to Top Music, News and Sports on Live Radio from All over Nepal. 7. Top News Stories and Highlights with images. 6. Live Bullion Info on current price of Gold, Silver, etc. 7. View Weather information of various cities of Nepal. 8. 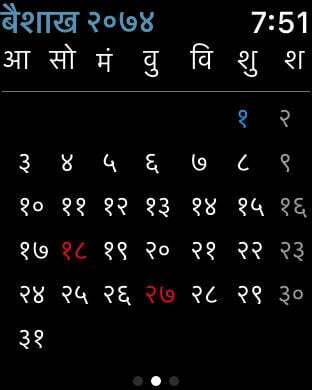 View daily horoscope in Nepali. 9. View Air Quality Index for Kathmandu City. 10. View Current Fuel Price. 11. 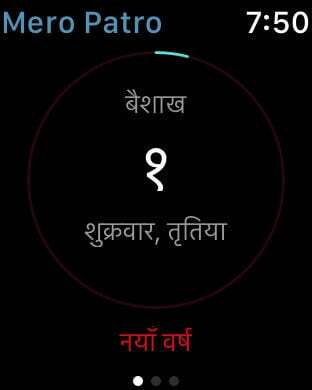 View Nepali dates in Watch complications.